Mahatma Gandhi was a political and spiritual leader of India. He helped India gain its independence and is honored in India as the ‘Father of the Nation’. Gandhi was an advocate of nonviolence and was the first to employ non-violent tactics in the political arena on a large scale. His life inspired others like Martin Luther King Jr to employ non-violence in fighting for civil rights. Mohandas Gandhi was born on October 2nd, 1869. His father was chief minister in the Porbandar state in the Indian Empire. As a young boy he read many Hindu Scriptures and Indian Classics, and this gave him a foundation for his work in later years. Due to the customs of the region at that time, at age 13 he was married to a 14-year-old girl. After suffering a miscarriage, they went on to have four sons. In 1888, Gandhi traveled to London and studied law in University College London and was trained as a barrister. He wanted to establish a law practice in London but failed. Instead he accepted a job from an Indian firm in South Africa. In South Africa, he witnessed and experienced racial discrimination. This led him into politics as he fought for the rights of Indians in South Africa. It was in South Africa that he earned the honorific ‘Mahatma’ which means “high-souled” or “venerable” in Sanskrit. In 1915, when he returned to India, Gandhi entered politics and began speaking at the National Indian Congress. He spoke out against certain British policies that discriminated against Indians. He was arrested a few times in his life, but his first arrest caused a mass protest outside the jail, forcing the judge to let him go. Gandhi employed non-cooperation, non-violence and peaceful resistance as his “weapons” in the struggle against the British. His most famous protest was the Salt March. To protest against the British monopoly of salt, he organized a 388-kilometer march to the sea at Dandi, Gujarat to make salt himself. This campaign was successful and the colonial government decided to negotiate with Gandhi. World War II intensified India’s desire and demand for independence. India was eventually partitioned along religious lines and Pakistan was created. The division of India sorely upset Gandhi who believed in religious unity. Gandhi was assassinated in 1948, a loss that was mourned deeply by his country. Gandhi also believed that we had to be the change we want to see in the world. If we want to have a positive impact on the world, we have to first develop positive those qualities in ourselves — good habits, discipline, humility etc. Constant growth is important for a leader. Remain open to learning and improving yourself. Develop your skills. Your effectiveness as a leader depends on your ability to grow alongside your team and your organization. What have you done lately in order to become a better leader? In the fight for independence against the British, Gandhi knew that if they fought using conventional means, they would not win. Instead, he decided that adopting a nonviolent approach would be much more effective. Against the mighty British, tactics such as fasting, hunger marches and political rhetoric became weapons as Gandhi used the power of influence and persuasion to win the support of Indian people across the country. As a leader, using influence and persuasion is much more effective than brute forcein convincing people to follow you with their hearts. This involves the clear articulation of your vision, the ability to motivate and inspire, and the courage to lead from the front during tough times. Get your team to believe in you and your vision, and they will stick with you through the difficult path to reaching your goals. Gandhi famously said “A ‘No’ uttered from the deepest conviction is better than a ‘Yes’ merely uttered to please, or worse, to avoid trouble.” He demonstrated his resolve to this principle throughout his life, with adhering to his principles of nonviolent protest. Notably, when he served as leader of the Indian National Congress Party, he refused to participate in, or condone the violence committed by other party members. In your own leadership journey, you may sometimes have to make unpopular decisions or say ‘no’ to your supporters for the greater good of the organization. And while it’s tempting to give in and be a people pleaser, the real test of a leader is when he does what he believes is right despite criticism or pressure to do otherwise. The man whose words of silence and peace echoed louder than any shouts of violence or screams of rebellion, Gandhi showed to the world a message that keeps on inspiring. In this book, the biggest proponent of nonviolent resistance retells the story of his life in his own writing. Peer into the mind of one of the most iconic spiritual figures of our times. See the world through the eyes of Gandhi, the revolutionary leader who dared to challenge all notions of truth, politics, love, spirituality and much more. Explore the turning points and crucial moments in Gandhi’s life that led him to become the “great soul”. Written by Eknath Easwaran who grew up in Gandhi’s India, this book truly conveys the effects and influence of Gandhi’s teachings and views. For leadership profiles of other famous Spiritual leaders, including Jesus, Buddha, and Mahatma Gandhi, check out our Spiritual Leadership Profiles section. Also check out our Leadership Profiles book series. 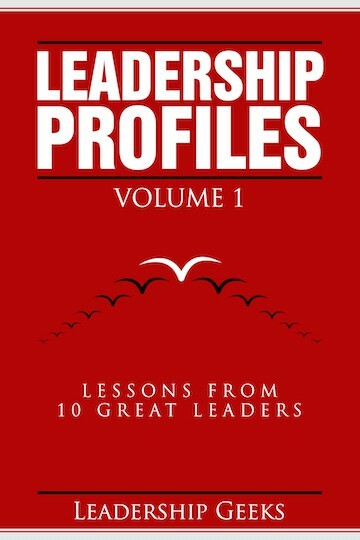 In each book, we study 10 influential leaders in Business, Military, Politics and Sports.